In this tutorial, we will explain how to use the method of joints to calculate the internal member forces in a Truss system or structure. 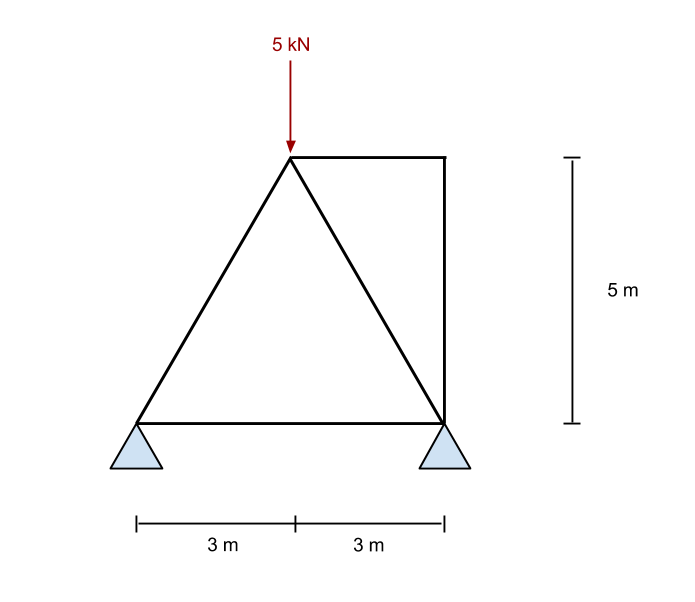 These forces are known as Axial Forces and are very important in truss analysis. If you’re unclear about what a truss is seen in our article – What is a Truss. 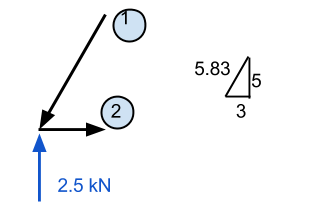 The Method of Joints basically involves looking at each of the ‘joints’ (where the members meet) and applying static equations to solve. Zooming into this point, we see all the known forces acting on this point. From statics, we know that the forces in the x and y-direction both must sum to zero. Accordingly, if we know that there is an upward vertical force, then there must be a downward force to counteract it. Since we already have the value of an upward facing force, then we will try to evaluate member number 1 first. Here we require some knowledge of vectors. It is important to remember that all the forces must sum to zero for both the x and y-direction. 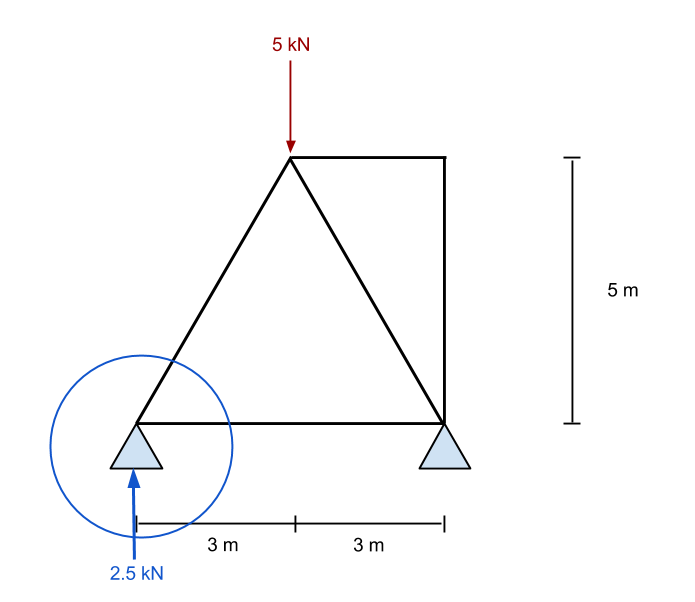 In our example, the horizontal distance is 3m while the vertical is 5m – leaving us with the hypotenuse equal to approximately 5.83 m. Using this, we can deduce that the normal force component of member 1 is equal to (5.83)/(5) times the vertical force of 2.5 kN. This equates to 2.92 kN, and MUST be a downward acting force if the point is to stay stationary. Member 2 can be calculated in much the same way. If we know that member 1 is acting downwards, then we know it must also acting to the left. 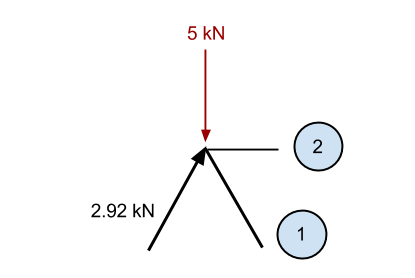 Accordingly, we know member 2 must be generating a force that is pulling the point to the right to maintain the forces in the x-direction. This value is calculated by (3/5.83) x 2.92 kN and is equal to 1.51 kN. 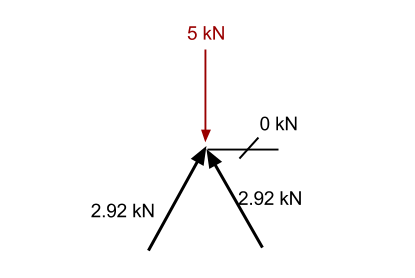 Much the same way as before, if we sum the known vertical component of the 2.92 kN member (2.5 kN in the vertical direction) and the – 5kN downward force, then we have excess in the downward direction of 2.5 kN (5 – 2.5). Accordingly, we know that member 1 must be causing a force in the upwards direction to keep the point static. 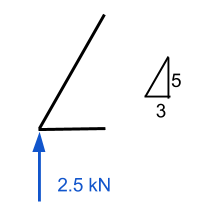 This force must have a vertical component of 2.5 kN, and since it is at the same angle as the previous member, then the internal axial force must also be 2.92 kN. Now we consider the forces in the x-direction. 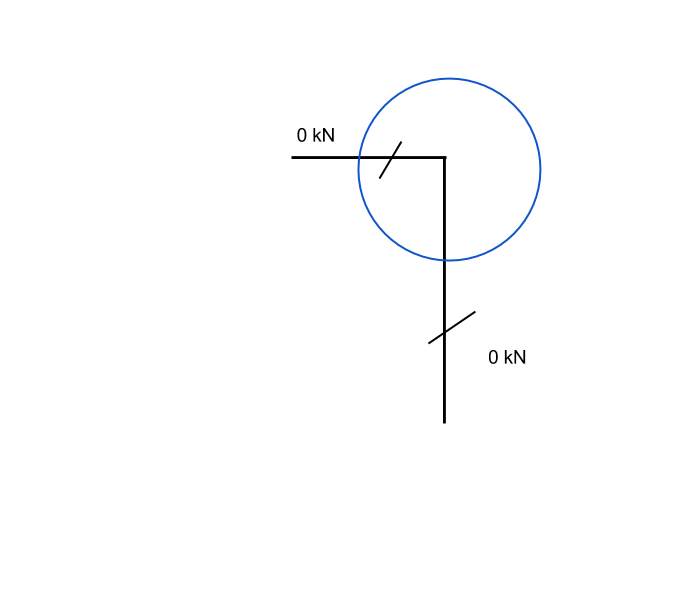 In this point, all the vertical force from member 1 is resisting the vertical force of the previously calculated member. This means the sum of forces in the x-direction is already zero. Accordingly, there can be no force in Member 2 or else the point will become unbalanced and no longer static. Looking at this point, we can see there is a special case. 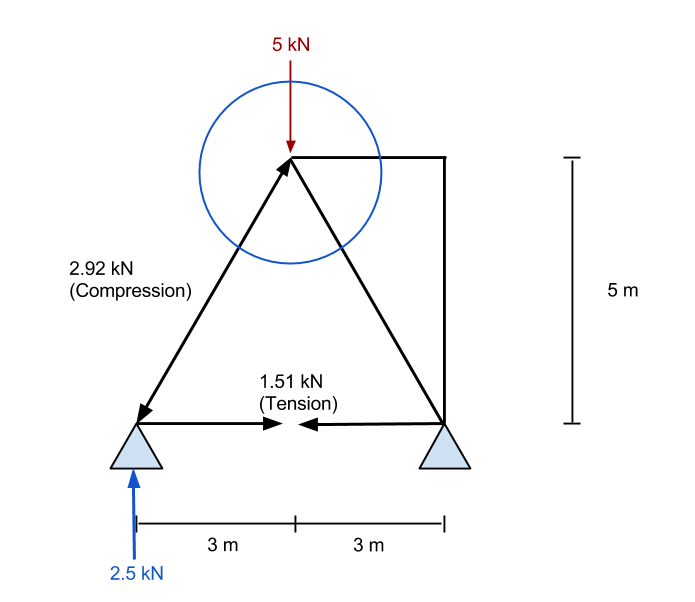 In this situation, any force pushing up will have no possible resisting action, as there is no other member that is able to provide a downward force to keep the point static. Accordingly, since the sum of forces must be zero, that member can have no force associated with it. It, therefore, has no force in it and is known as a Zero Member. Again, if we look at summing the forces in the x-direction, we can see there is only one member that has any force in the x-direction. Accordingly, this must also have 0 axial force in order for the sum of forces to equal zero. Finally, we end up with the following result for our truss. We can see all the resulting axial forces inside the member and the reactions at the supports. 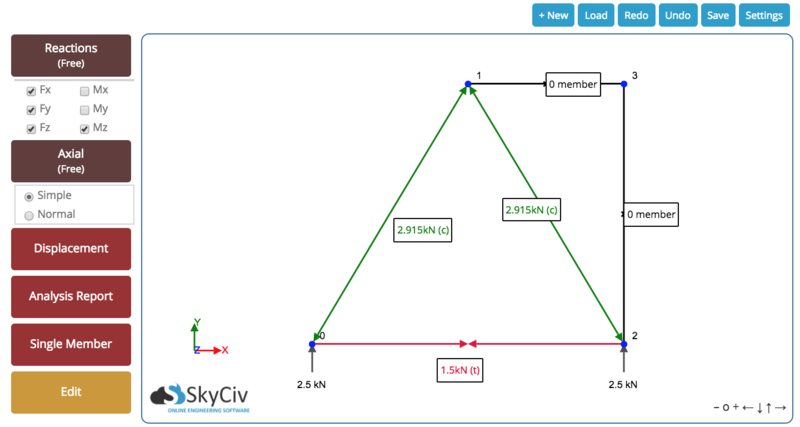 The following result was taken from our Free Truss Calculator – give it a go, it’s Free!